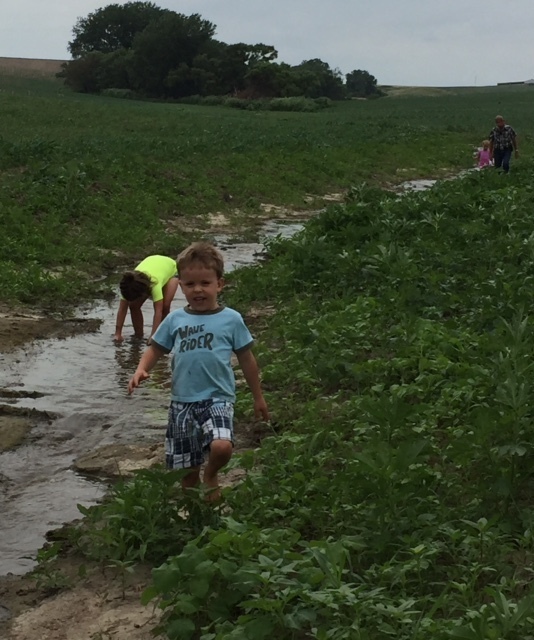 Our farm becomes “Camp Ruskamp” each summer when nieces and nephews come to visit. 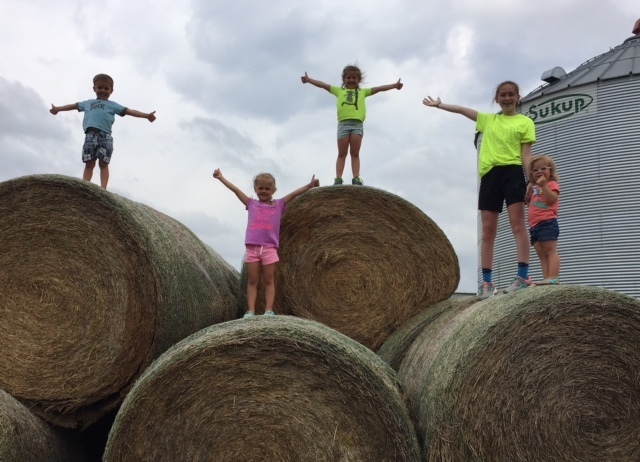 This camp experience gives our extended family members a chance to learn about farm life and have camp style experiences. We recently hosted our nieces and nephew Tabitha, Maria and Elijah. Our granddaughters, Ella and Harper, joined us for added fun on one of the afternoons. small, square bales our children climbed on when they were young. Maria and Elijah surprised me when they told me they had never been beyond our house and fish pond. We toured the feedlot via the Ranger to see how the cattle live. A load of Synergy (modified wet distiller’s grain) arrived as we drove around so we watched the product unload via a belt inside the trailer. The tour continued to the barn where we assess cattle that might need treating and the kids met Tonja, the barn cat. The kids learned how the cattle move through the low stress handling system as seen in this interview. We made plans to watch the movie “Temple Grandin” that evening with some of Steve’s homemade popcorn. 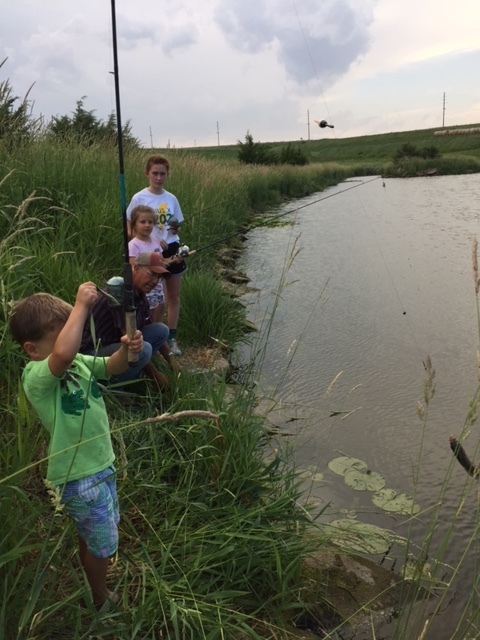 Fishing-notice Elijah’s fish in the bottom right corner. 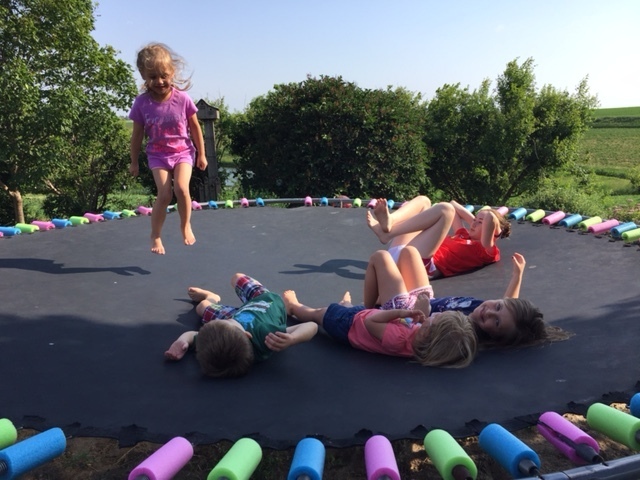 Trampoline Jumping-our granddaughters made an afternoon visit. 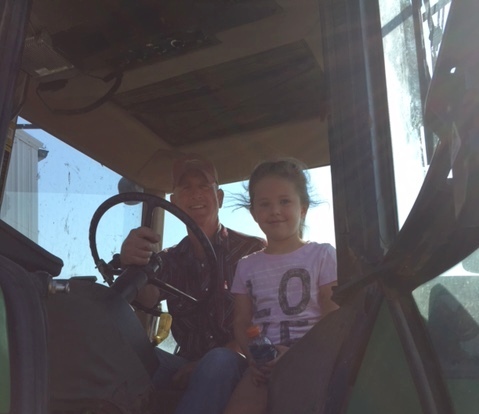 Tractor rides-Maria rode along with Steve to box scrape pens. the stream running through the field. 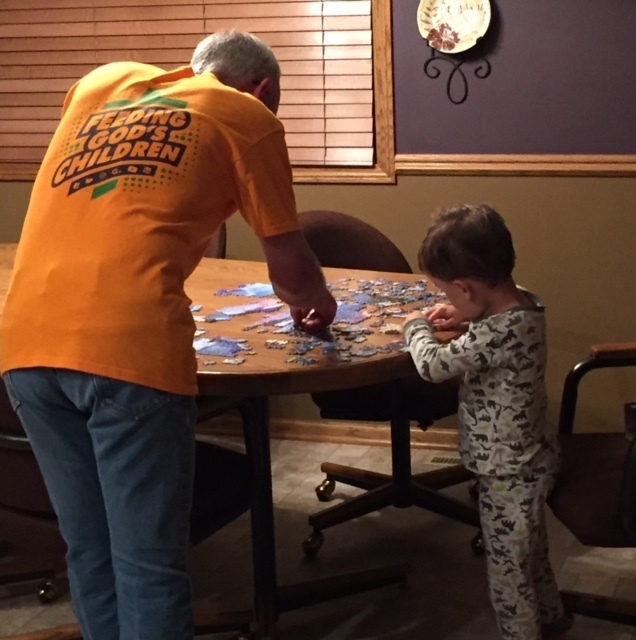 puzzle to work on with Steve. One of the reasons our nieces and nephew were with us was their parents were enjoying some time away for their 25th wedding anniversary. The kids and I decided it would be fun to make a gift for their parents. We decided to make a flag using wooden pallets. My thought process led us to get four flags going using an assembly line process. Tabitha stayed on task while the younger two fought over sweeping the shop. This was a win/win project since Steve had his shop swept while we worked on the flags. I hope their parents are pleased with this special gift! 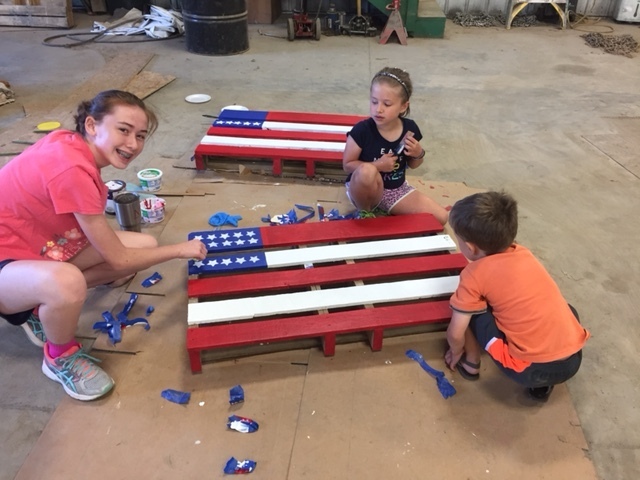 The kids put on the final touches of paint and remove the tape! What is a farm/camp experience without animals to love on? 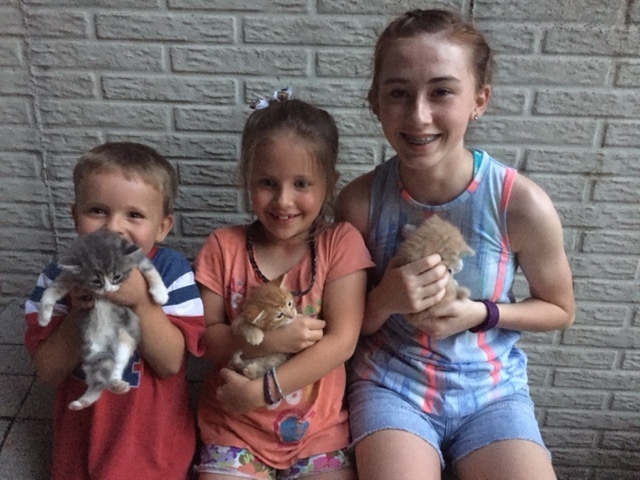 We aim to please and had three little kittens for these three kids to love on while they were there. Yes, we will be looking for good homes for these kittens in the next month or so! Hey thanks for posting all these pictures they look like a lot of fun and I had a Jolly time looking at them keep up the great work and keep us posted with more, thank you so much. Thank you for your compliments! I hope to get another post off soon!